Hello fellow altaholics! We’ve known for a while it’s harder to run alts in Neverwinter than it should be. As some of you may know, we recently lowered the cost of the Campaign Completions in the Zen Market, but we wanted to do more. With this next release, we are introducing “Signets of Patronage”: account-bound tokens, one for each campaign, that your main can make and hand to one of your alts. 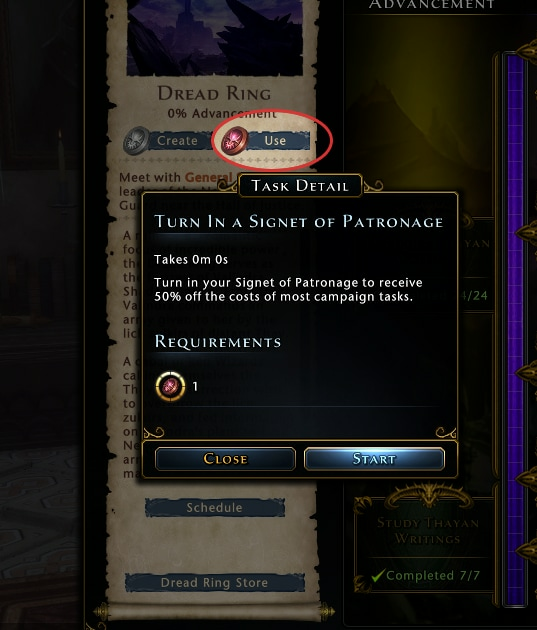 That alt can turn in the Signet to progress in the campaign at double speed! 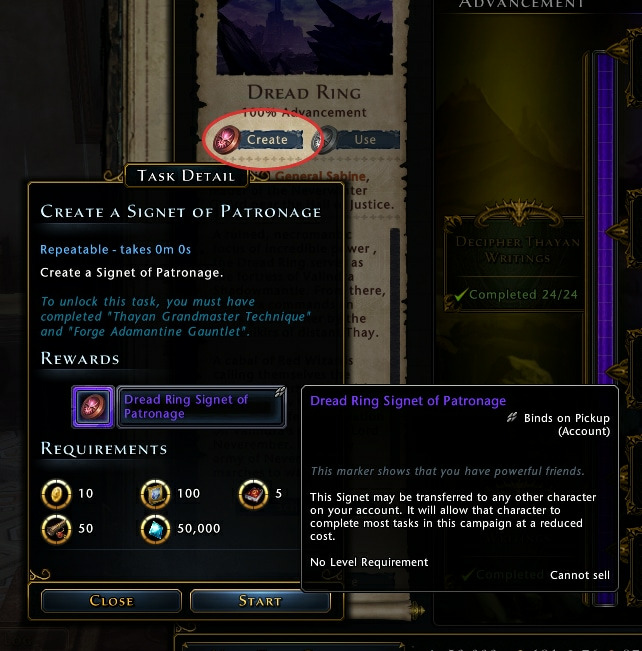 If a character has finished a campaign, they can make a Signet of Patronage for that campaign. “Finished” doesn’t mean 100%; it varies by campaign, but basically means “has done all the important unlocks and has earned all the boons”. Making a Signet costs some campaign currency (typically about as much as an end-stage campaign task) plus 50,000 Astral Diamonds. The Signet is account-bound, so it can be given to any character on that account. The character you give it to can turn the Signet in, consuming it, but enabling that character to complete most campaign tasks at 1/2 price (and earning rep at x2 normal rate, if the campaign has rep). The exception to the 1/2 price is that those campaign tasks whose main purpose is to create items, like the Dragon Hoard Enchantments task in Tyranny of Dragons, are not discounted. That’s because we didn’t want to decrease the value of those items, and we didn’t want people to feel they had to make an alt with a Signet of Patronage just to create those items efficiently. Only a few tasks fall into this category, and they are generally not requirements for other tasks, so this exception won’t slow down alts who want to use a Signet of Patronage to progress more quickly through a campaign. We hope that Signets of Patronage will make it easier and more fun to have alts in Neverwinter!